The Electronic Ticket number is a thirteen-digit code that you can find in the booking confirmation e-mail or printed on the paper ticket. If you have any further questions, consult our FAQ. 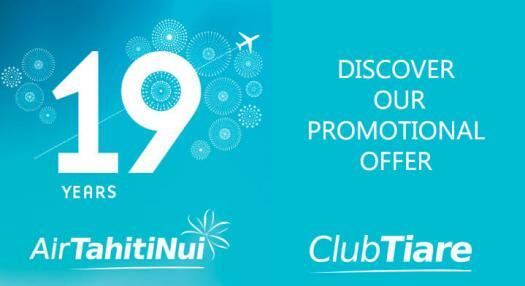 Air Tahiti Nui will soon celebrate its 20th anniversary and celebrations are starting with a year full of surprises and discoveries for your enjoyment ! To thank you for your loyalty, Club Tiare is launching an exclusive offer just for you. Travel in Moana Economy or Poerava Business class and get 10 000 miles discount on your round trip award. For more information please contact your local Air Tahiti Nui travel advisor. We look forward to welcoming you aboard and thank you for your loyalty. For Packages, Flight Deals and so much more, please enter your email here.